Did you hear? His aunt owns Lemuria! Aba. And here's one of the songs he played at his Greenbelt gig last night. Screaming teens at Darren have made me gone deaf, I think. haha ;p Thanks to OleanderJacob for uploading this vid on YouTube. Btw, another Glee star, Mark Salling (aka Puck) is also in town. 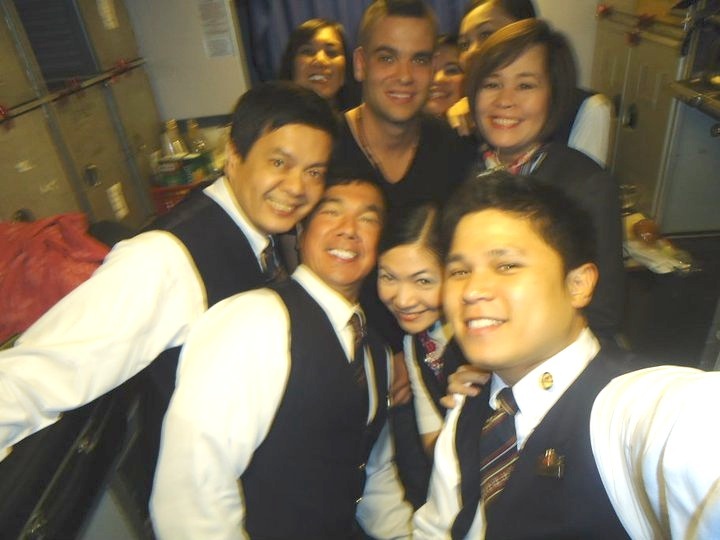 PAL flight steward Dan Lira posted photos w/ the celebrity on his FB page two days ago, but the story was only picked up yesterday. Judging by the way he is smiling in the photos, Mark looks like a very nice and generous guy. Very accommodating to the photo requests. Mark, who flew in from Los Angeles via PR 103, is supposedly in Boracay now. Wow. Treat him well, my Boracay friends. That way, he'll be able to spread the gospel of Boracay/Philippines to his friends and family back home. What a great way to promote the 'Pinas.